After the death of her grandfather, Zhou Da abandoned the traditions of her family and threw herself into the study of science and biology. Now a renowned paleontologist, Zee eats, sleeps and breathes dinosaurs. Years later she finds herself comfortable with her life and career, until she receives an unexpected invitation from her godfather — a conservation scientist — to join a select team of professionals in researching a classified project near a small village in rural China. After fighting lifelong embarrassment and stereotypes associated with her heritage, she finds herself leaving her best friend — a fellow paleontologist — Beck and the familiarity of home for an adventure in the country of her parents birth. While on assignment, Zee finds herself growing close to a handsome Italian colleague who challenges her feelings about China and the importance of her family’s culture in her life. In Shanghai, a dangerous organized crime syndicate catches word of the new discovery, and will stop at nothing to take the treasure for themselves. When the elements of the organization shows up in the village, Zee is forced to confront the demons from her past while fighting the real world monsters who threaten to take everything her team has worked for. Never in a million years could Zee have predicted how much this journey and the people she meets along the way would change her life. While uncovering the prehistoric find, Zee unveils something even bigger about the universe and within herself. Twelve years ago I taught English in a remote village in China. 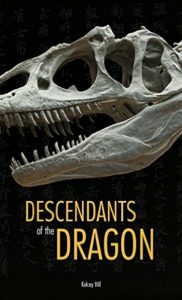 My experiences there helped inspire the setting and history aspects for Descendants of the Dragon. I also have a crazy love for dinosaurs so this book became the best of both worlds. My main character Zee is a paleontologist. She was inspired by my love for dinosaurs. My other characters came alive on their own but are inspired by places I have been or would love to go. I grew up in Salt Lake City where the majority of people around me belonged to one religious and social demographic. The influence and power that has inspired the struggles and personal growth and journey of my main character. It was a day in early May when Stanley shared his very first story with Zee. She had just graduated with her bachelor’s degree from Berkeley and was home for the summer. Almost every morning she would begin her day standing under the large apatosaurus in the lobby of the Natural History Museum. She walked in the moment the museum opened, before the public began to arrive. She looked tiny beneath the long arching neck and lengthy tail, an endearing metaphor for the size of this young woman’s dreams and ambition. After a few minutes she would walk through the calm, quiet corridors to the Hall of Dinosaurs. Where she would spend a solid hour studying the prehistoric creatures. After a couple weeks Stanley found himself looking forward to seeing her there. The mornings he didn’t see her felt incomplete. Her obvious passion for the dinosaurs was intriguing. He longed to be a part of it. He wanted to learn her story. Zee was standing face to face with a sixty eight million year old female triceratops the day Stanley finally introduced himself. She hadn’t moved in five minutes. Stanley walked over and stood beside her. It was a good minute before she realized he was even there. She looked over at him feeling embarrassed and apologized profusely for hogging the viewing space. Stanley smiled. He had never seen anyone love those fossils more than her. He introduced himself as a benefactor to the museum. Zee kindly obliged with an introduction of her own. She was an aspiring paleontologist. At the risk of sounding like an old man on the prowl, he invited her behind the scenes to view an upcoming exhibition he was funding. He had a fossil of his own he wanted to share with her. Without hesitation Zee accepted. From that very first moment Zee knew there was something about this man she liked. He led her to another wing of the museum that was closed to the public. All the windows and doorways were covered making it impossible to see inside. As they stood outside the mysterious space Zee could hear hammering from the construction crew inside. Stanley took a key out of his pocket and unlocked the door. He held it open for her and invited her in. She stepped through the threshold into a massive open construction zone. A team of men in hard hats were working hard assembling displays on the evolution of whales. Zee’s jaw dropped to the floor as her head turned upward to the ceiling. High above her, suspended from the steel rafters, was a seventy nine foot long blue whale skeleton. After minutes of gazing at the floating creature she slowly turned to Stanley. The look of excitement and wonder on her face was priceless. He walked her over to a couple of chairs and invited her to sit. Despite all the noise going on around them, he began to tell his story. From the moment he opened his mouth the world around them disappeared. It was just the two of them, in the icy waters of Antarctica, in pursuit of the Japanese whalers.